Today is the release day at Taylored Expressions. All the October release products I have been sharing in the sneak peeks for past three days are now available at Taylored Expressions store. 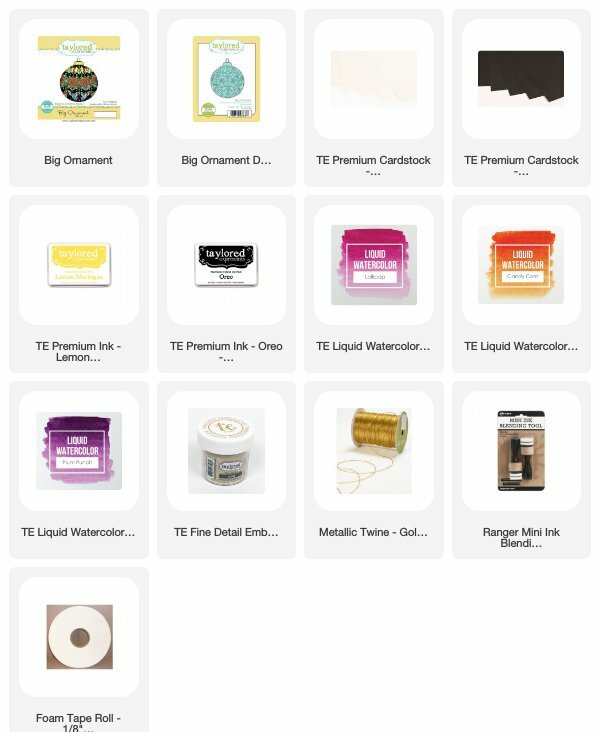 I have two projects to share using couple of new products. 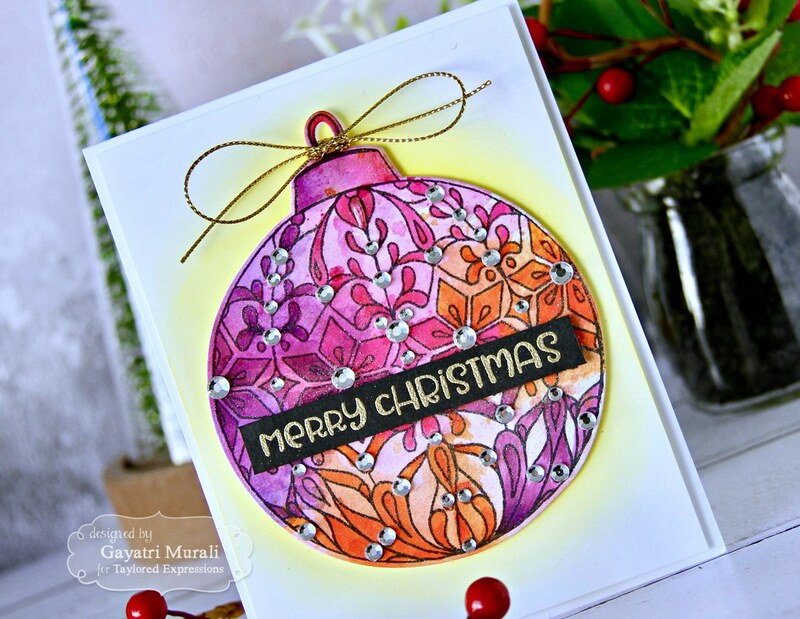 The first project uses the Big Ornament stamp and coordinating die. Love love this big ornament as it fills the entire card front. You do not need to add anything more other than a sentiment. That is what I have done here with my card. I smooshed TE Plum Punch, Lollipop and Candy Corn Liquid watercolors on watercolour cardstock panel and once dry, stamped the Big Ornament image using Oreo hybrid ink. Then I came in with copic markers to add shading to the details on the ornament. Using the coordinating die, I die cut the ornament out. To highlight the ornament, I sponged TE Lemon Meringue dye ink on a white Sugar Cube panel and adhered the Ornament die cut using foam adhesives. I used gold twine to add a bow to the ornament. The sentiment is from Simply Said Christmas stamp set which I gold heat embossed on a strip of Oreo cardstock and adhered on top of the ornament. I adhered this panel to Sugar Cube cardbase using foam adhesive and embellished the ornament using rhinestones. The second project showcases two new products. 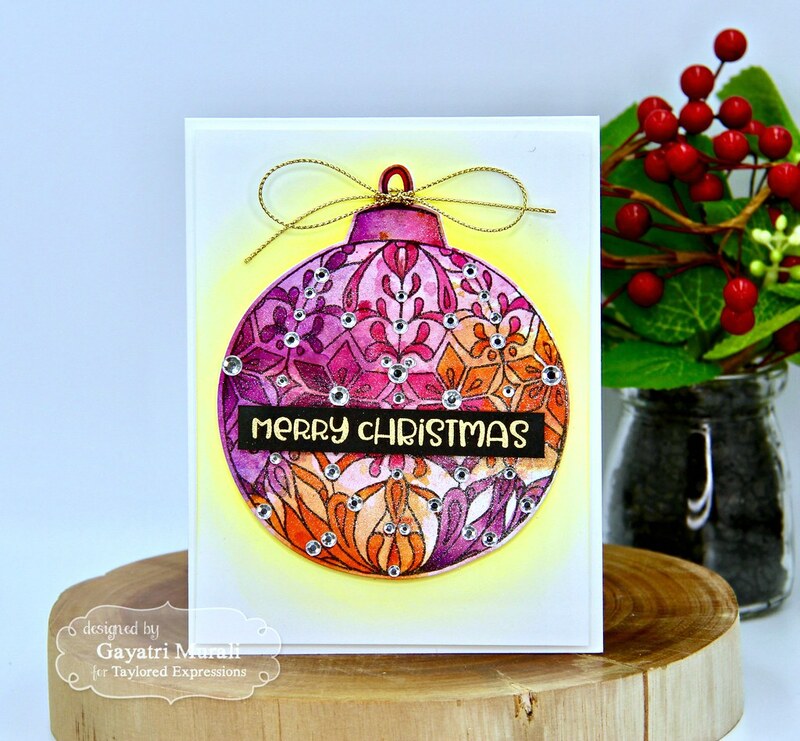 The Blooming Holiday cutting plate and the Pink Christmas stamp and die combo. I die cut the Blooming Holiday cutting plate using Sugar Cube carstock. To highlight this die cut, I needed a colourful background behind it. So I sponged a Sugar Cube panel using TE Guava, Candy Corn, Lemon Meringue, Sprinkles and Confetti Cake dye inks. 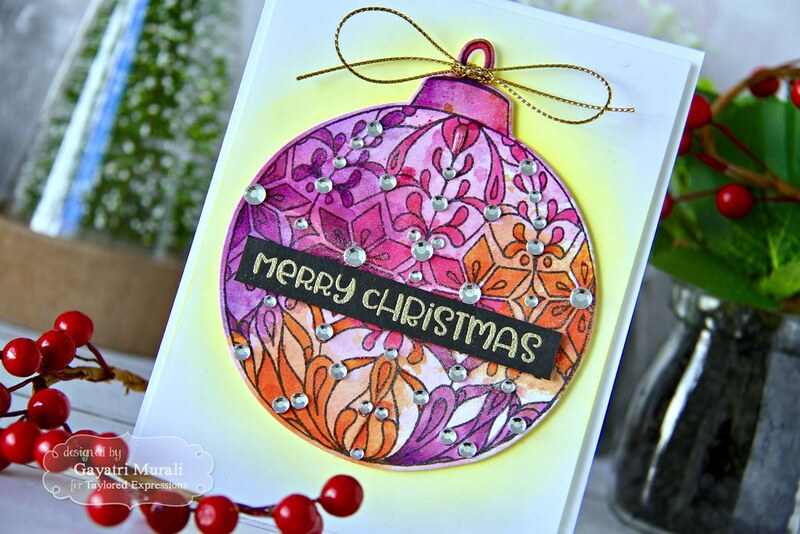 I adhered the Blooming Holiday die cut over this sponged background. Using the white pen, I added highlights to the coloured areas. I adhered this panel to the Sugar Cube card base using foam adhesives. 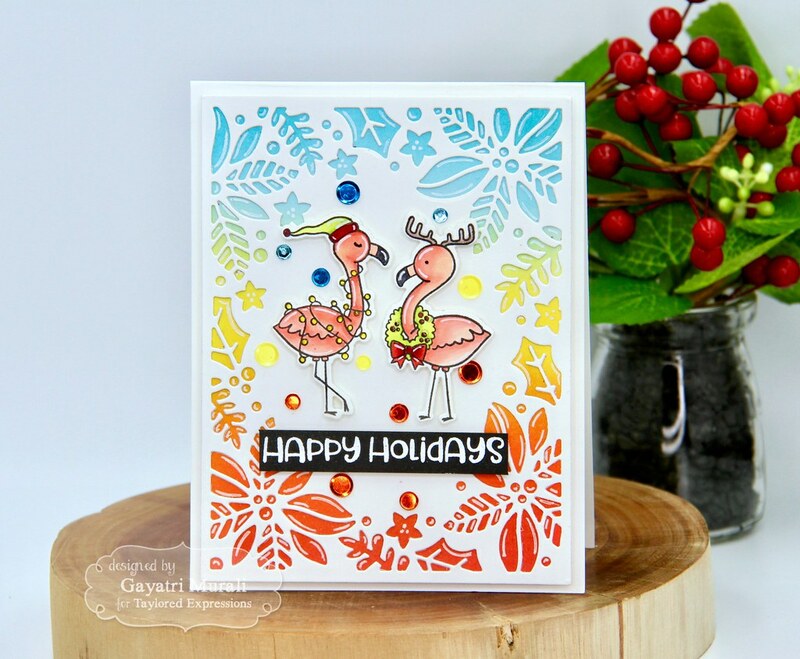 For the focal image, I stamped, coloured and die cut the two Flamingo images from Pink Christmas stamp and die combo. I adhered them on the centre of the Blooming Holiday die cut using foam adhesives.I also used white pen to add highlight details to the coloured image. The sentiment is from Simply Said Christmas stamp set which I white heat embossed using TE white detailed embossing powder on to a strip of Oreo cardstock. I adhered this strip below the flamingos using foam adhesives. Then embellished the card using TE sequins. Hope you have enjoyed visiting my blog for past four days and got inspired by my projects using Taylored Expressions October release products. 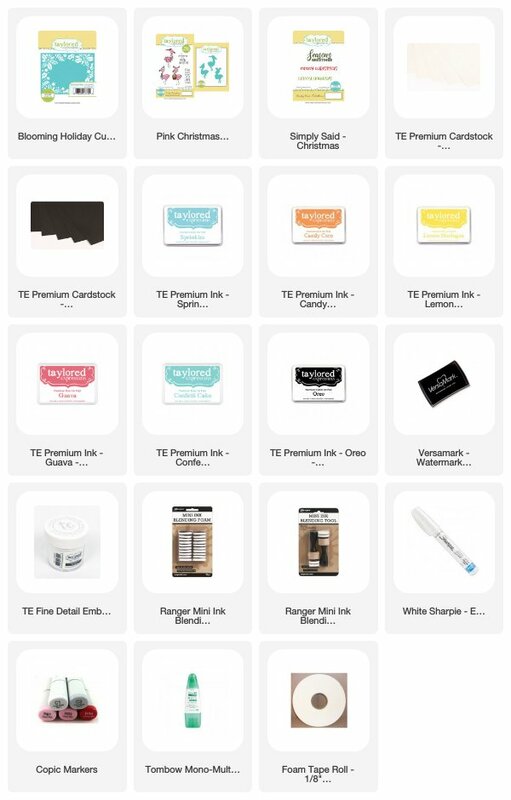 All these products are now available for purchase at TE store. Head over to TE blog for more design team inspiration. Beautiful Cards! I love all of the color in them. That cutting plate is fantastic. Thanks for a great week of inspiration! Fabulous cards! I especially love the flamingo one!